The story of earthly natural wonders often begins over a billion years ago. Such is the case with mainland ice caves on the south shore of Lake Superior. Tracing origins is like descending a rabbit hole of history because choosing a start date is elusively arbitrary. This story begins, albeit arbitrarily, with some widely accepted hypotheses of the conditions leading up to what we now can experience in the Lake Superior ice caves. Over one billion years ago, sandy minerals were carried several hundred miles northward by rivers and braided streams. Over one billion years ago, rivers flowing north transported suspended particles of eroded minerals that fell out of suspension as the water's velocity slowed to be deposited the into a low-lying basin where the ice caves are today. Millions of years ago, the minerals transported by rivers into the basin eventually cemented into the friable sedimentary rock called sandstone. The sandstone of this area is known as the Bayfield group. Bayfield group sandstone has about 75% quartz, with lesser amounts of feldspar, mica, iron oxide, chert, and ferromangesian minerals. Thousands of years ago, receding glaciers carved cliffs from the sandstone along parts of the south shore of what is now Lake Superior. Centuries of erosive wave action from the lake, and centuries of seasonal freezing and thawing has carved arches, chambers, and passageways into the sandstone cliffs. 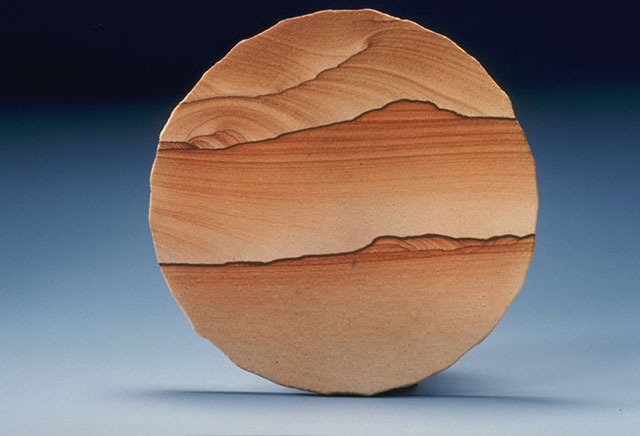 Sandstone is porous so it has the capacity to store and percolate water. Today, when lake ice conditions are stable and greater than 10 inches in thickness, curious people can hike along the frozen shoreline to peer into the ice caves. Apostle Islands Sea Caves, Apostle Islands National Seashore, National Park Service. Mainland Sea Caves - Ice Caves, Apostle Islands National Seashore, National Park Service.